(R.R.P. £159.99). 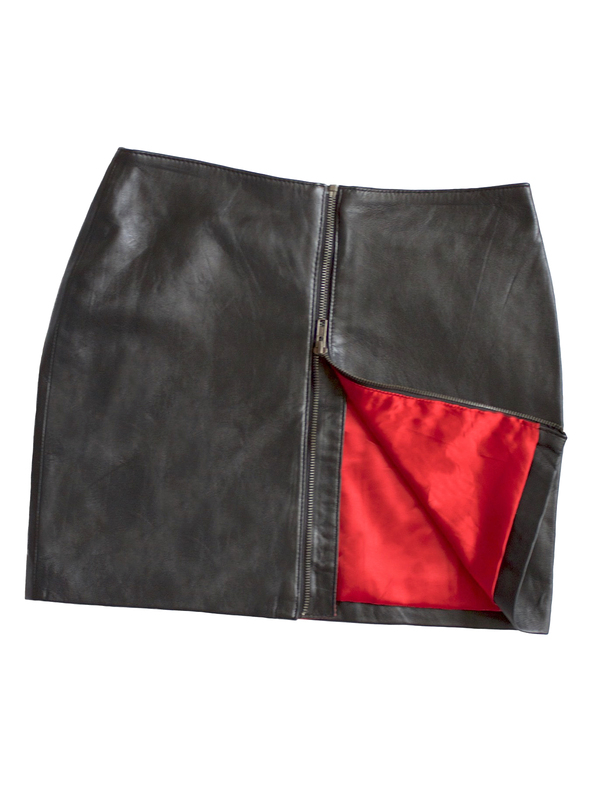 A very fine quality black leather mini skirt with a full back zip opening in a standard mini skirt length, made in super soft lambskin nappa leather, sourced only from British hides. It features a full length rear zip in antique gold-coloured metal that opens fully and fastens from the top downwards. Wear open a little at the bottom to be a little more revealing! The skirt is lined in red satin fabric. Styled to sit at the waist, it is beautifully tailored for a close, figure-hugging fit. Length (from waist to hem): 15-16in/38-41cm, depending on size. Made exclusively for the Tout Ensemble label by Ashwood to our own design. A superior quality black leather mini skirt with full back zip opening made in super soft lambskin nappa leather, sourced only from British hides. The full length rear zip in antique gold-coloured metal opens fully and fastens from the top downwards – to wear, you wrap the skirt around you and then fasten the zip. Wear open a little from the bottom for extra effect and to reveal the beautiful red satin lining. Made exclusively for the Tout Ensemble label by Ashwood. (R.R.P. £159.99) Fabulous quality - a classic black leather mini skirt in an unashamedly plain and sleek style, made in super soft lambskin nappa, sourced from British hides. It is exquisitely tailored for a figure-hugging fit. Standard mini length - 15in-16in (38cm-41cm) from waist to hem, depending on size. It fastens with an attractive golden metal zip at the rear plus discrete popper stud, and is lined in a rich red satin fabric. Made exclusively for the Tout Ensemble label by Ashwood to our own design Please see our Product Description below for full details and important sizing information. NOTE: This same style is available in other lengths - Extra Short Mini: 12in;; Above-knee: 19in (click on the links to see each one).